Thick Arctic sea ice will form the rock-solid platform from which Parks Canada underwater archeologists and Royal Canadian Navy divers will launch an unprecedented exploration of the wreck of HMS Erebus later this week. Nearly 170 years after the crushing forces of Arctic ice helped doom Sir John Franklin's quest for the Northwest Passage, there is more than a little irony in the fact that deep sea ice is about to provide new opportunities to delve into the mysteries of the expedition's fate. 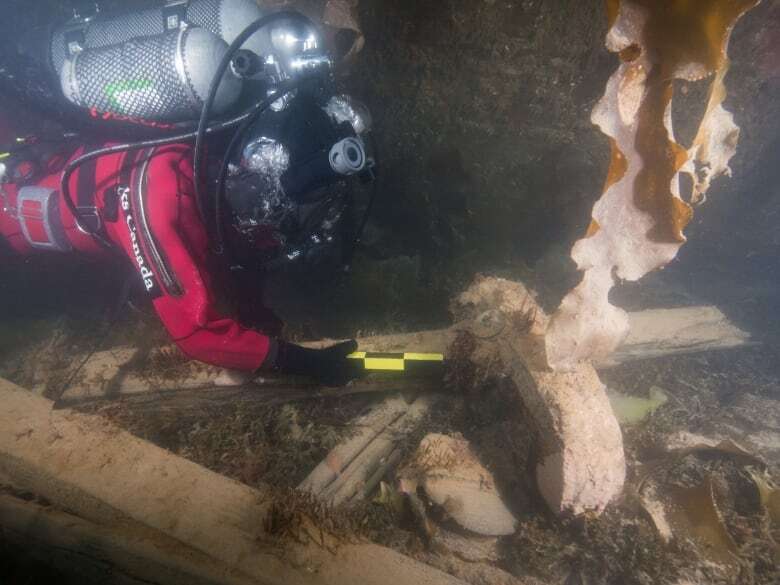 Ice two metres thick will form the platform from which Parks Canada underwater archeologists and Royal Canadian Navy divers will launch an unprecedented exploration of the wreck of HMS Erebus this week. This week's episode of The Nature of Things on Thursday at 8 p.m. on CBC-TV uses CGI, re-enactments and a good old-fashioned adventure yarn to lay out how Sir John Franklin's expedition became the worst disaster in polar exploration history. The ice dive comes seven months after the converted British bombing vessel that was one half of the Franklin Expedition was discovered remarkably intact at the bottom of Queen Maud Gulf off Nunavut. "With ice cover, there will be no wave action," says Ryan Harris, a senior underwater archeologist for Parks Canada. "Without the waves stirring up the seas, all the particulate settles down to the sea floor and it creates fairly ideal clarity conditions. It's almost like diving in an aquarium." And that's particularly good for the new high-tech, 3D laser scanning tool that will be deployed as archeologists try to create the most detailed images possible of the wreck lying about 11 metres below the surface. "We want to take advantage of the water clarity to do a very thorough baseline recording of the wreck site before any future interventions take place," says Harris. The ice cover also provides a base for the camp that will house the 32 members of the combined Parks Canada and navy dive team who have trained together for the operation, becoming familiar with each other's equipment and techniques. "This ice now is providing that stable platform where we can live," says navy Chief Petty Officer 2nd Class Larry Lyver. A Parks Canada diver measures part of the Franklin expedition's Erebus on Sept 18, 2014. (Thierry Boyer/Parks Canada)"There's no up and down. There's no motion. Short of the confined space we're going through, this is the most stable and safe platform that we can use to conduct this operation." Access to the wreck will come through three triangular holes bored through the ice — each side of each triangle will be about two metres long. Needless to say, deciding where to drill those holes is key, and will be guided by sonar data already collected. "We'll go back with survey grade GPS mapping equipment and we'll make sure we're putting these holes precisely where we want them," says Harris, noting the desire for accuracy so that access is as easy as possible for the divers and the umbilicals providing continuous air from the surface. He's thinking of one hole on the port side of Erebus, another on starboard and one near the stern. Plans at this point aim for 14-hour dive days — beginning around 8 a.m. and going until 10 p.m. over a 10-day period starting Thursday or Friday. Two-person dive teams will be deployed in steady succession — each team will include one Parks Canada member and one navy member. The chilly –2 or –3 C water becomes a key factor determining how long divers stay down. "We can be in the water for more than an hour; we're dressed for it," Marc-André Bernier, the head of the Parks Canada underwater archeology team, told a technical briefing last month. During training over the past several months, Parks Canada divers more used to scuba gear familiarized themselves with the navy's ice diving equipment and strict safety protocols. Navy divers, who are more familiar with underwater tasks such as mine countermeasures, routine and emergency underwater repairs and explosive ordnance disposal, learned about underwater archeology techniques. "Our divers, they're great at working underwater, but we're going to a national historic site here, a very significant wreck that's been untouched primarily by anybody yet," says navy Lt. Greg Oikle, who is lead planner of the dive team. "We wanted to make sure that our divers were prepared to go down and do the work that Parks Canada needs done without disturbing it." As much as people are curious about what lies inside Erebus, Harris says it's important to get the baseline recording done before archeological efforts proceed more significantly and systematically into the ship's interior. Still, archeologists will be peering inside Erebus, which along with HMS Terror, was beset in ice in 1846 and abandoned two years later off the west side of King William Island, according to Inuit accounts. "We'll definitely be exploring with what we call a POV camera … on a telescopic pole," says Harris. 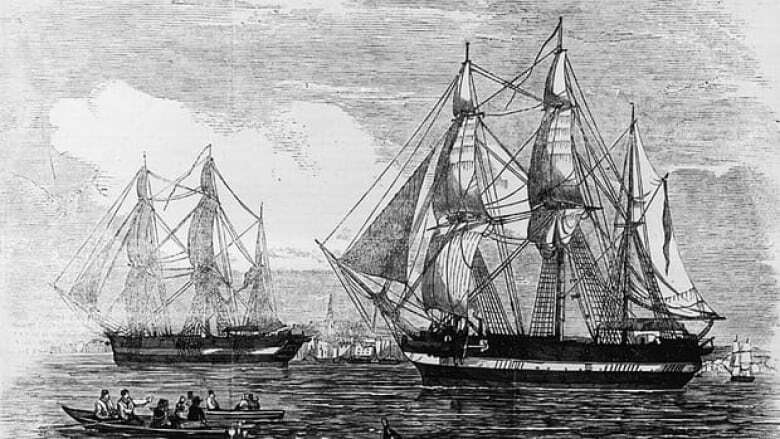 HMS Erebus and HMS Terror, shown in the Illustrated London News published on May 24, 1845, left England that year under the command of Sir John Franklin and in the search of the Northwest Passage. (Illustrated London News/Getty Images)"We're going to try to shimmy that [camera] into some of the little nooks and crannies to try to peer below the height of the weather deck and perhaps even farther below that." Harris says they are prepared for a "limited amount of artifact recovery." The ice dive — done in conjunction with and support from Joint Task Force (North)'s annual high Arctic sovereignty operation, Nunalivut — is in many ways an unprecedented partnership. It's also a logistical challenge, particularly given the remote — and undisclosed — location. Plans call for a C-130 Hercules transport aircraft and smaller Twin Otters to ferry all the equipment and people around. "We're … in the middle of nowhere on this dive so if we don't bring things with us, we don't have them," says Lyver. 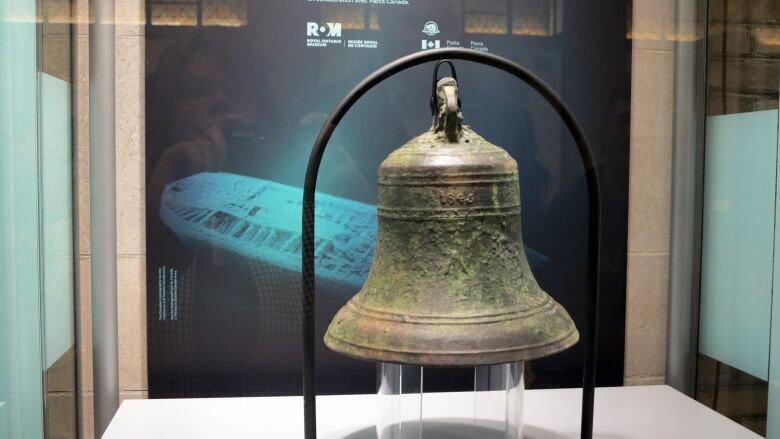 A replica of the bell from HMS Erebus, which was recovered late last summer, is the centrepiece of an exhibit that will travel to Canadian museums. (Janet Davison/CBC)That means bringing everything from heaters, tents, water and food — individual meal packets like soldiers consume and which Oikle is not overly enthused about — to a decompression chamber and a doctor to ensure prompt care if a diving emergency arises. As logistically challenging as the Erebus dive is, there is also a great sense of anticipation around it. Jim Balsillie, former chairman and co-chief executive of BlackBerry-maker Research in Motion, who is involved in the Parks Canada-led search, will be at the dive camp for about five days as a guest. "I'm very excited to get up there," says Balsillie, who along with Tim MacDonald founded the Arctic Research Foundation, which has supported the search for several years. "I'm looking forward to seeing what they are going to bring up. I wonder if they're going to solve a couple riddles and mysteries and start a couple more while they're at it," Balsillie says. Topping his list of potential finds would be a wax-sealed canister with documents in it, something he thinks is possible, given the disciplined code British naval officers had. Oikle and Lyver are also enthused. "To be able to come up here and be a part of this operation and explore and hopefully answer some of the questions that the world has been asking, it's truly significant for me, a pinnacle in my career really," says Lyver. For Harris, who has recalled the "Stanley Cup" moment of first spotting Erebus on a sonar screen, the anticipation is long-term, and includes whatever the material remains left behind by the sailors can ultimately reveal about their experiences. Who were the final survivors among Franklin's 128 crewmen? What were they trying to accomplish? "Did they still maintain any hope of sailing this ship into the Beaufort Sea or were they more or less hunkered down and waiting for the end?" says Harris. "And then there's a whole line of questions we need to explore with respect to the Inuit experience with this wreck site." At this point, the answer to so many of those questions is simple: Who knows? "The exciting thing about archeology comes in the surprises," says Harris. "We can have a reconstruction of what happened but ultimately the archeology will inevitably present its particular surprises. It can be quite shocking when it does."